While strawberries are a fruit tailor-made for dessert, they also add delicious, sweet acidity to any breakfast. This lovely berry porridge, made with rolled oats, is especially good because it’s not too sweet: There’s no added sugar. It also takes only 15 minutes to make, which is perfect for a quick weekday breakfast. Start your morning by celebrating early summer's strawberry harvest! Here, seven best-ever strawberry breakfast recipes to make now. These fantastic scones get their hearty but tender texture from a mix of whole wheat pastry flour and all-purpose white flour. This lovely berry porridge, made with rolled oats, is especially good because it’s not too sweet: There’s no added sugar. Finally, a granola that's not too sweet: This one, from Zoe Nathan, is toasty and crisp, brimming with nuts, dried fruit and coconut. Nathan serves it with plain Greek yogurt—any fat level will do—and a generous dollop of her garnet-hued strawberry compote. This recipe makes extra granola, which keeps well. Many stuffed French toast recipes call for cutting a pocket into each slice of bread. This one, however, simplifies the technique by sandwiching the creamy, fruity fillings between two slices. 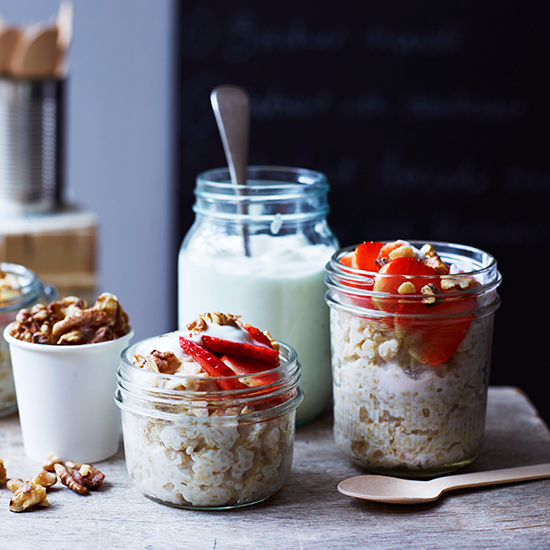 This no-frills recipe combines just four ingredients: rolled oats, milk, almonds and honey. A fantastic breakfast or snack, it pairs perfectly with diced strawberries.